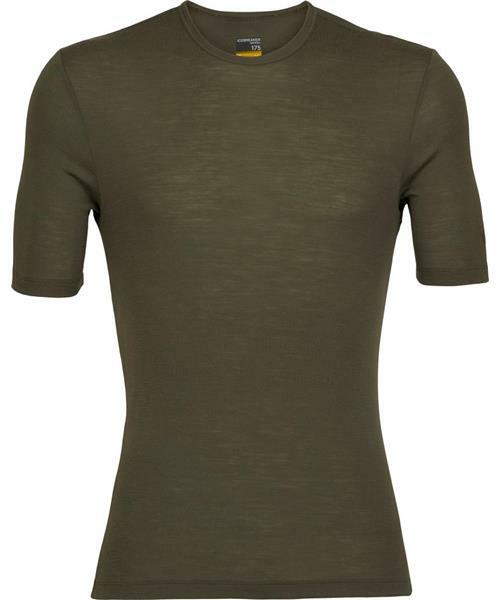 Icebreaker's 175gm Everyday Short Sleeve Crewe offers all the benefits of lightweight, breathable merino in a stretchy rib fabric that moves with you. These wardrobe staples are perfect for easy, comfortable insulation. 175 Everyday SS Crewe- Mens is rated 5.0 out of 5 by 4. Rated 5 out of 5 by PNWcop from Great Undershirt for LEOs I've always been allergic to wool, so the comfort level is reflects the itch that is noticeable when I'm not busy. The itch is there but not nearly as bad as any other wool product (I haven't noticed an itch with Icebreaker products that are blended with other material, just the 100% wool stuff) and I don't get hives unlike other wools. I can live with this itch. I wear the shirts under body armour. They don't get excessively hot when I'm inside, and keep comfortable outside too, whether sedentary at a roadblock or active on a dog track. The itch is a price I'm willing to pay for the benefits of these shirts which are otherwise amazing. With winter coming I'm going to order some long sleeve shirts. Rated 5 out of 5 by Bmakeiv from Best base around Love my Icebreaker base wear, it’s all I use under my snow gear. Rated 5 out of 5 by Bush from All day everyday Love it. This shirt is perfect. The rib nit is very breathable.